I’m sure most people can remember what it was like to start high school. I remember I was nervous about making friends and fitting in. Considering I’m not very outgoing and rather introverted, this was doubly so. As the nerdy, geeky type, I would often wear “Star Wars” shirts and keep my books out in the open in the hopes that people with similar interests would notice and find me. Ahmed Mohamed was starting high school. He was wanting to show his teachers what he could do and find a group similar to the robotics club he was in in middle school. Think about this. He was wanting to find encouragement and a group he belonged to. This need and want to fit in is extremely easy to relate to. Instead he was accused of building a bomb, handcuffed, taken away from school, interrogated and booked. I nearly cried when I saw this picture. This look on his face is heartbreaking. Here is a kid who has a wonderful hobby, a hobby he can make a career out of. And instead he was treated like a criminal. Correct me if I’m wrong, but aren’t schools supposed to be a place where teachers encourage creativity and learning? Or, in additional to racial bias, are we so accustomed to teaching to a test that teachers are no longer able to think and instead make outrageous accusations? Think of how this could have been different if this teacher had asked about how he built it, or what the wires do, or tried to understand what he had built rather than assuming it was a bomb. This teacher blew a precious opportunity to encourage a child’s interests. 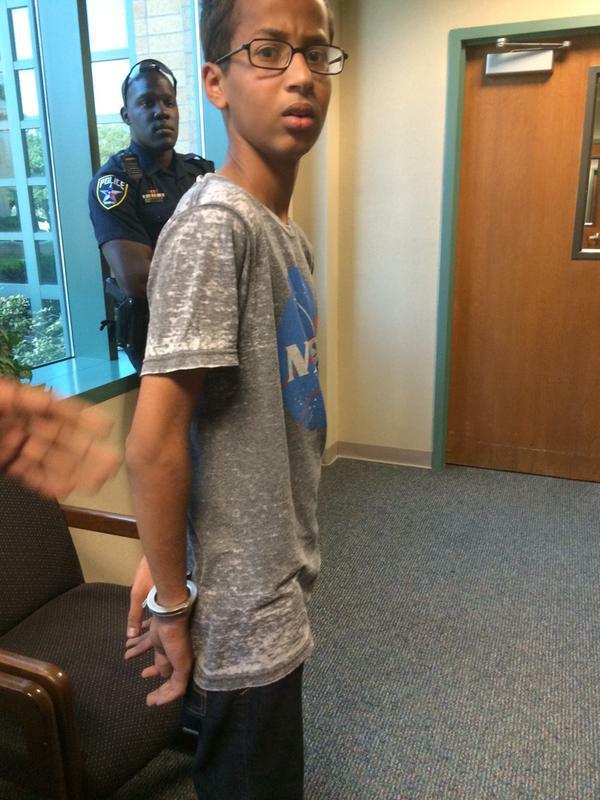 I am so glad that President Obama, Mark Zuckerburg and others have stepped out to support Ahmed. Hopefully this will counteract any damage that was done. I’ve seen people minimizing this saying that this was “character building” or “people are falsely accused all of the time.” While something good can come out of a bad situation and “build character”, it does not mean it was right or okay for it to happen in the first place! And while people are falsely accused, it does not mean that they were not damaged by the false accusation. As someone who recently was on the receiving end of some false allegations I can personally state it hurts a lot and I have lost a huge amount of trust and am still recovering. I wish everyone who has ever been falsely accused had people rise in support of them like Ahmed did. Which is why I am adding my voice to those who support Ahmed. Keep inventing, keep pursuing your passions! This entry was posted in prejudice and tagged admed mohamed, false accusations, fitting in, i stand with ahmed, teaching on September 17, 2015 by roianna.